A truly family-friendly ski and snowboard resort solves two issues that have nothing to do with mountain runs. The first is, what can you do with tots too young to take lessons? And the second is, what can you do with the kids in the evening? Both Winter Park Resort, Colorado, and Smugglers’ Notch Resort, Vermont, provide children’s centers for little ones as well as family-friendly evening activities. And of course, both resorts operate well-run snow sports schools with lessons for kids and adults. Situated 67 miles northwest of Denver, Winter Park is the closest major ski area to Colorado’s capital, a welcome relief for plane-weary kids and adults. You can drive to the resort or take a shuttle van from the airport. Another bonus for parents: Winter Park offers less expensive lodging than Vail, Beaver Creek, and some other Colorado ski areas. And for those traveling with tots, the Children’s Center at the base of the mountain cares for youngsters ages 2 months to 6-years-old. With seven areas or “territories,” Winter Park consists of 3,081 skiable acres, making the ski resort Colorado’s fourth largest. Eager knuckle-draggers (beginner snowboarders) start lessons at age 3 instead of the more typical age four. Classes for 3 to 14-year-olds divide into groups by age and ability with a limit of eight to 10 children per class. For more attention, register your children or yourself for the MAX5 program, which pairs one instructor to no more than five students. Along with skiing and snowboarding for ages 14+, MAX5 groups are also available for ski bike lessons. Pedaling down the mountain is not only fun, but reassuring since you can regain your balance by putting your feet on the ground. Beginners graduate to Discovery Park, an area that allows novices to hone their skills without worrying about colliding with fast skiers. Six terrain parks provide ample play for more advanced skiers and boarders. The National Sports Center for the Disabled, located at Winter Park, is the largest adaptive sports program in the world with more than 3,000 participants and 1,200 volunteers. In winter, the Center provides adaptive equipment plus ski and snowboarding lessons. Go tubing, snowmobiling, and ice skating as well as take a scenic snowcat or sleigh ride. Smugglers’ Notch solves the “What do we do with the kids in the evening?” problem by providing family karaoke, dog-sledding, arts and crafts classes, snowshoe night tours, and an indoor, new FunZone with mini-golf, basketball, giant slide, and a climbing wall that should be open in late 2016. 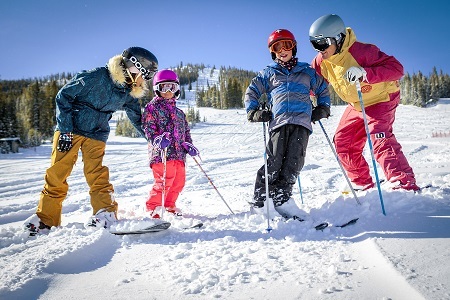 Families can stretch their snow sports budgets by buying a Club Smugglers’ Advantage package that bundles condominium lodging with ski/snowboard camp for kids and other activities. Smugglers’ Notch, located 30 miles east of Burlington, centers around an easily negotiated ski village from which skiers and snowboarders can access the resort’s three mountains. Treasures, the childcare center, looks after infants 6-weeks-old to tots 3-years old. 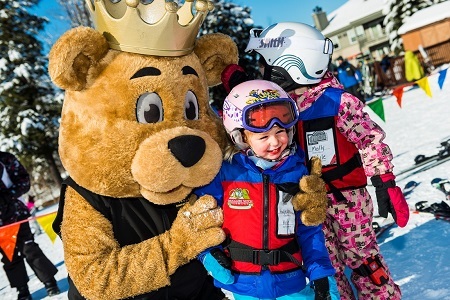 To accustom little ones to skiing, ages 2 ½ to 3 ½ years – old can participate in a Little Rascals On Snow lesson. At Smugglers’ Snow Sport University, kids are divided into age-appropriate classes that separate 3 to 4 year-olds from 5 to 6 year-olds. Those ages 6 to 10 and 11 to 15 can enroll in skiing or snowboarding group lessons. Teens 16 to 20 meet friends and perfect skills at special two hour lessons. Morse Mountain, home to most of the beginner terrain, features lower lifts that are easier for novices to use. At a Mom and Me or Dad and Me session, go down the mountain with your kids while learning tips from an instructor on how to teach your children. With Smugglers’ Family Fun guarantee, if you don’t learn or improve your skills at classes, you receive your money back for the lessons. At Sir Henry’s Learning and Fun Park, one of several terrain parks, boarders can perfect jibbing skills at night. At Burton Riglet Park, preschoolers use small boards to try out mini-half-pipes and rails. Slide down the tubing hill, warm up with hot chocolate at the bonfire, play games at the weekly carnival and watch fireworks. When the new $4.1 million indoor FunZone opens this winter, take on obstacle courses, laser tag, bouncy houses and more.